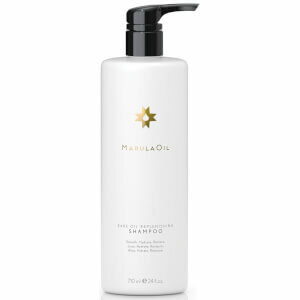 The Paul Mitchell Marula Oil Rare Oil Replenishing Shampoo is a sulphate-free shampoo that gently cleanses while deeply nourishing. Infused with infused with cold-pressed Marula Oil, an ingredient packed with powerful antioxidants and replenishing Oleic Acids, the shampoo effectively lifts away dirt and impurities while delivering instant hydrating, taming and softening benefits. Time-release MarulaSpheres adhere to the hair shaft and burst open every time you brush or touch your hair, releasing a fresh surge of Marula Oil throughout the day. Hair is left feeling soft, hydrated and full-bodied. Apply to wet hair, massage and rinse.